The "lug" just behind the Extractor as well as alot of other stuff make this a 1903.
alot of these suffered at the hands of amatuer gunsmiths and the markings were defaced using a buffing wheel. yours looks like one made later as the rear bridge looks like it may be flat and could have a dovetail, the bottom metal looks like its milled not stamped if that is the case the bottom metal was robbed from an earlier model. I’ve got very little knowledge on this subject!!! But.............Didn’t Mausers have claw extractors ??? You're right both times, the extractor on a 1903 is a claw as well the "lug" I was refering to is visible behind that long leaf springy thing in the first picture. 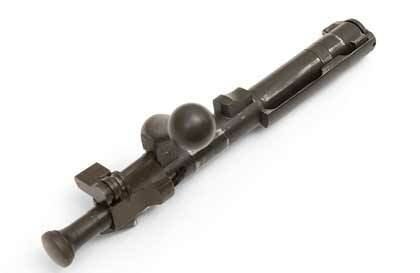 Angle of the bolt handle and the firing pin stud is what told me that was a M1903. 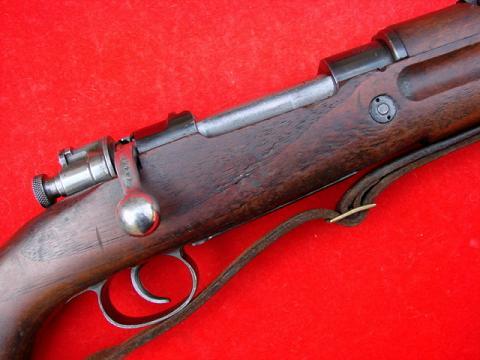 The M1903 is distinctive in that way, as when the American's copied the Mauser action, just like the British they changed it to suit their needs instead of buying the patterns that Mauser was making for Germany and every other company in the world. Maybe but I've seen mexican mausers with a similiarly shaped striker and bolt handles get changed alot on sporters. alright WICKY,,,, your plan worked .the heat on them worked. i used the hair dryer like you said and they still would'nt budge .however,once they cooled they were no problem taking out. and DIMITRI ,there was no thread-loc on them but that was my thought at first too.was'nt even thread-loc on the scope base either ,but there will be and fnuser you were right too,was'nt a german military mauser.. so everyone ,thank's,, i knew with all the experienced marksman on here i'd find out how to get the screws out. now for whqt i found out :::: the rifle is a US REMINGTON 03-A3 so now what's it worth do y'all think. NOW''' i have another question,under the front scope mpont where the name was ,there was a shim 1/32 or so thick .what would be it's purpose and would i really need to replace it? You have to admit though the "lug" on the same plane as the bolt handle that falls ahead of the rear bridge is much more difinitive. As I have also seen strikers modified or completely ground off to decrease locktime. some modern scopes have alot of elevation adjustment and that may resolve your problem the leu vxIII 1.5-5x comes to mind I cured one that way. The shim was more than likely put in to deal with a limited amount of scope adjustment or to correct a alignment issue from the factory. 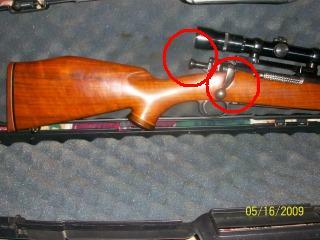 Pre64 Winchester model 70’s were notorious for needing shims. Pre 64 mod 70 another claw. Sure is !!! Familiar with that one !!! I wasn’t able to see it in the pic KH posted.